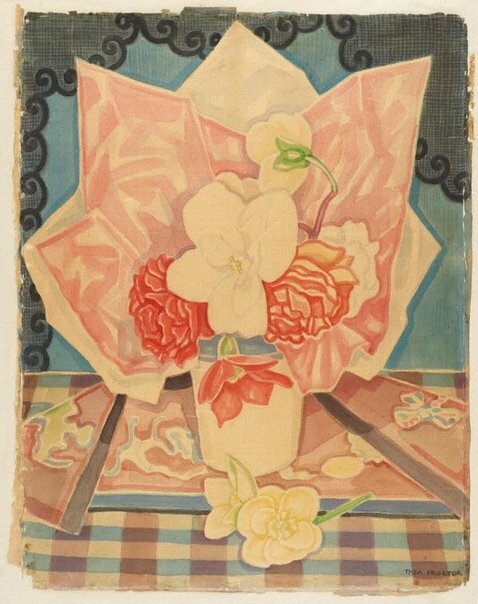 Despite their delicacy of colour and texture, Thea Proctor's skilful arrangements of shape and pattern in watercolour, demonstrate an unwavering command of design. A checked tablecloth that appears with slight variation in a number of the artist's still life images, reflects a re-use of favourite motifs in multiple works that was characteristic of her approach. A love of flowers and flower arranging was part of Proctor's interest in imbuing all aspects of everyday life with elegance and beauty. Her advice was regularly sought in connection with public displays of flowers, while photographs of her floral arrangements and articles on the subject were published in 'The Home' magazine. Proctor made many watercolours on silk, including fans, a technique popularised by Charles Conder. She began painting fans while living and working in London from 1903-21, and her still life compositions were well known in Australia from the 1920s on, particularly in Sydney where she was an influential member of the art world. Signed l.r., watercolour "THEA PROCTOR". Not dated.